October approaches and with it comes winter, at least in the hills. Whilst warm sunny days giving an illusion that it’s still summer do occur October days are more often chilly even if the sun is shining. Rainy and windy days are colder than only a few weeks ago. The first snows fall, often not lasting long but just as cold as later in the winter. Clear nights bring frosts and ice on pools. 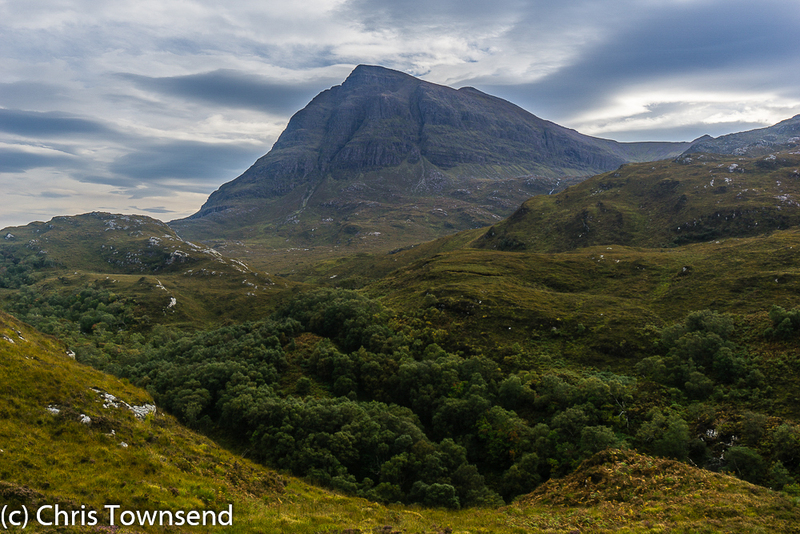 October is also one of the most colourful months of the year with autumnal tints from glen to summit. Golds, russets and reds brighten the landscape as winter closes in. It’s a great month to get out in the hills but extra gear is required and it’s the month when I start to add items to my pack, beginning with extra clothing and headlamp. 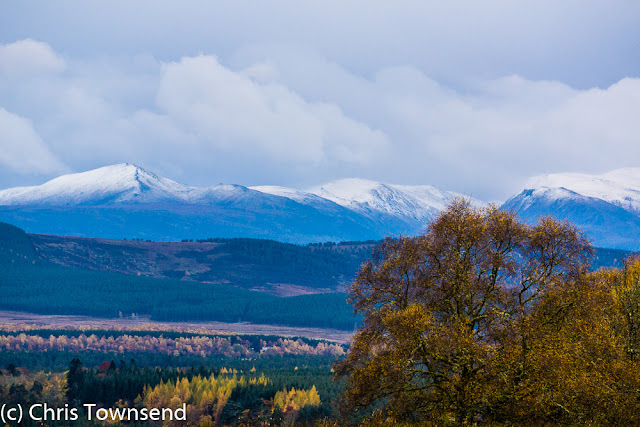 In the Scottish Highlands winter can begin in October. 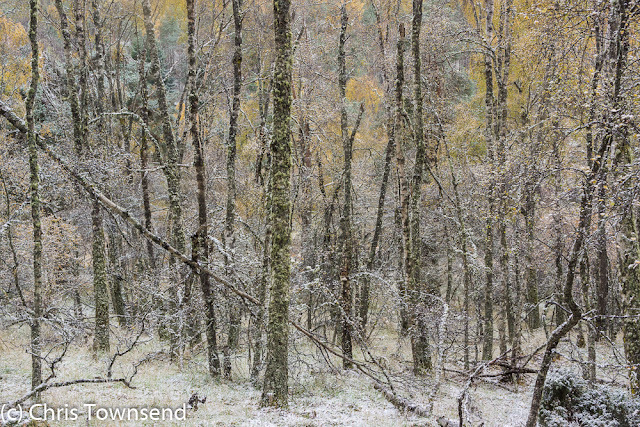 To illustrate this I’ve included some wintry October photos. Quite a few years ago I wrote a piece about the gear I wear and carry in winter. Below is an updated version. With winter approaching it’s time to search out the ice axe, crampons, insulated jacket, thick mitts, spare hats and insulated flask. 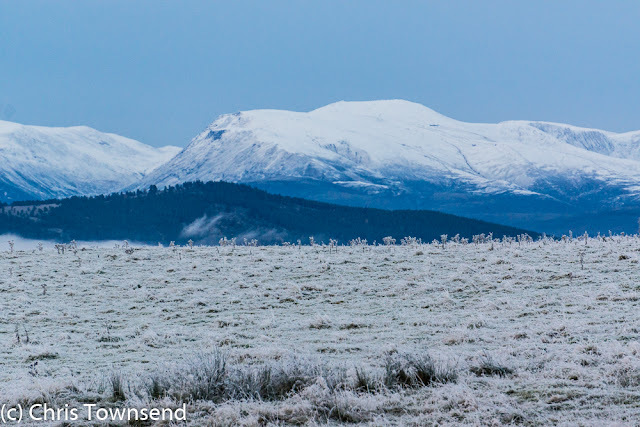 Hillwalking becomes a more serious pastime in winter and gear needs to be selected carefully. Here I’m going to look through my own daysack and discuss the clothing I wear as an example of what might be needed anytime from October to April. A larger rucksack is needed in winter than summer in order to hold extra clothing and items like insulated flasks and crampons. It should have straps for ice axes too. I like a sack that is easy to get into and with enough space for gear to be packed quite loosely as this makes it easier to find items when fumbling around with cold fingers. 35-45 litres is about right. At least one reasonably sized pocket for small items is useful. A front compression panel is useful for snow shovel or crampons and mesh pockets for wet items, water bottles and flasks. Water-sensitive items are stored in waterproof stuffsacks, which I find more versatile than a pack liner. Winter shell garments need to protect you from blizzards, spindrift, heavy rain and very strong winds. Lightweight summer garments can do so when combined with windproof midlayers but heavier clothing feels more secure and protective in prolonged bad weather. Shells can be worn all the time in winter as long as they’re comfortable and breathable enough. Good ventilation is needed too. I find Paramo shell clothing ideal in winter and it’s been my choice for over two decades now. The trousers are warm enough that I only need another layer when it’s exceptionally cold and windy. The jackets have excellent wired hoods, roomy pockets and sleeves with wide cuffs for good ventilation. They can even be rolled up if it warms up. I generally wear the Paramo clothing all the time in winter conditions so I don’t need a separate windproof layer. If the weather is calm and mild and the Paramo looks like being too warm I sometimes wear a windproof top and carry a light waterproof jacket. Unless the weather is mild I usually wear a thin fleece (100-weight or similar) over a base layer under the Paramo jacket. The fleece is the first item to go in the pack if I start to overheat. For rest stops I carry an insulated top. If the weather looks like being wet this will be a synthetic-filled jacket that’s large enough to fit over my shell jacket. If the latter is wet it doesn’t matter as the synthetic jacket will dry quickly and still keep me warm when damp. If the weather is frosty and dry and temperatures look like being below freezing I carry a down jacket. Whichever the top I always keep it handy at the top of the rucksack and put it on as soon as I stop whether I feel cold or not. It’s much easier to stay warm than to get warm and you lose heat very quickly in cold weather. In case of benightment or extreme cold I used to carry a pair of long johns. These are not easy to pop on when you feel a bit chilly though, making them really just emergency items. Having to remove your trousers to take them off if you overheat is a hassle too. In recent years I’ve carried synthetic insulated or down-filled trousers instead as these can be pulled on over your trousers, which makes much more sense. They’re comfortable for sleeping in too. I usually carry a pair of waterproof overtrousers as well, not for their waterproof qualities, but so that I can pull them on if my legs feel slightly cold but the insulated trousers would be too warm. Lightweight ones with long or full length zips are best so they can be donned over boots. I don’t like gaiters and only wear them if the snow is deep or the ground is very muddy. As they spend much time in the pack I like lightweight ones. Cold hands are unpleasant, painful and can affect your ability to do things so good gloves or mitts are essential. I always carry four pairs – liner gloves, midlayer softshell or windproof fleece gloves, thick insulated mitts in case of extreme cold,and waterproof shell mitts that can be worn over any of the others. Having all these also means I have back-ups in case of loss (gloves can be whipped away by the wind very quickly). Wind can easily whip heat away from your head even with a warm hat unless the latter is windproof so when it’s stormy I like hats with windproof shells, especially as I prefer not to wear a jacket hood unless it’s absolutely essential. Fleece ones with peaks and ear flaps are ideal. Because warm headwear is so important and hats can blow away I usually carry a fleece or wool hat too, which is fine on calmer days and under a jacket hood when I really have to pull it up. These are year round essentials of course. Even more than in summer I like to keep them in jacket pockets for quick access. I often carry a spare map too, in case one blows away. This has never happened but is always possible. In a blizzard finding your location on GPS mapping can make navigation much simpler – if you can use the device in the cold. Gloves designed to work with touchscreens and GPS units with large buttons make cold weather usage much easier. Carrying the device in a pocket helps keep it warm and prolongs battery life. It’s still always wise to carry a portable power pack too. Once the nights start to lengthen a good headlamp can be essential. I carry two. It’s much easier to swap them over if the batteries fade in one than change batteries – and much easier to change batteries when you can see. I always carry spare batteries too. Headlamps that use rechargeable batteries – an increasing number these days – can be charged from a portable power pack. However it’s not easy to use them whilst doing this so the other headlamp is always one that takes standard batteries. In summer I just carry a light bivi bag. In winter I prefer something a bit more protective so I take a group shelter, even when on my own. In a two-person one I can place my rucksack at one end and sit at the other. It’s far more comfortable than a bivi bag and I have used it as a lunch shelter on stormy days. It’s surprisingly warm inside a group shelter – condensation can be a problem – and great for morale even when alone. Snow, ice and freezing rocks are not comfortable to sit on. A foam mat can make a huge difference. I often don’t carry one in summer. In winter I always do. It’s bigger than the tiny sit mats you see in outdoor shops too, being either an OMM DuoMat or an offcut from an old foam sleeping pad. Both fit neatly down the back of my rucksack. Padded rucksack backs provide insulation too but if you sit on your pack make sure you’re not crushing anything fragile. Freezing cold water from an ice fringed mountain stream may be a revitalising drink but it’s not that attractive during a blizzard. Sometimes streams are completely frozen too and at other times they can be hazardous to reach. Hot liquids warm you up and have a great effect on morale so I always carry an insulated flask, usually containing a hot spicy drink (Rocks Organic Fiery Ginger Cordial is great – it has chilli in it). Snow can be added to a flask to top up the contents – this tastes fine with fruit juices and other drinks that are okay when tepid but not so nice with tea or coffee. I usually carry a 600ml flask plus a half litre water bottle, which is carried in the rucksack inside spare clothing so it doesn’t freeze. You can carry a stove and small pan for making hot drinks but I don’t usually bother on day walks. There’s little enough daylight in winter anyway without spending time boiling water or melting snow. 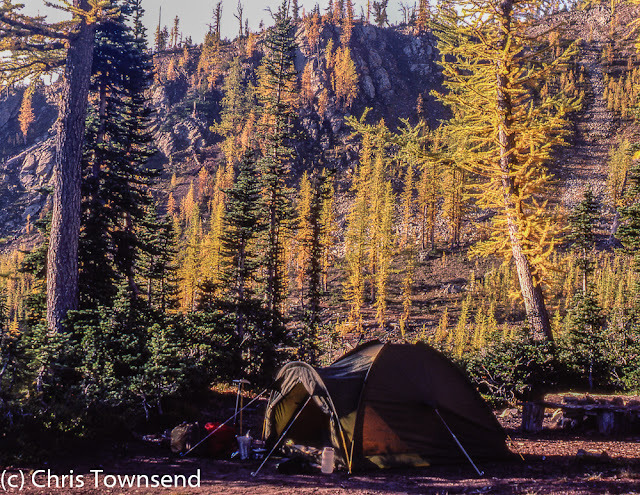 Even on backpacking trips I carry a flask as well as a stove and fill it up in camp. As in summer any food will do but complex carbohydrates (bread, cake, biscuits, flapjack) are better than simple sugars at providing long term energy. Because food is needed to keep you warm as well as provide energy I carry more than in summer. Chocolate, which I never carry when it’s warm because it melts, is a winter favourite for snacks. It needs to be emphasised that a trekking pole is not a substitute for an ice axe. On any terrain where a slip could be hazardous you need to have your ice axe in your hand. If you’re not sure if the terrain is dangerous have your ice axe ready anyway. That said, trekking poles can be just as useful in winter as summer. In deep snow they can be more useful, as long as you fit snow baskets to stop them sinking in too far. On hard snow and frozen ground that isn’t steep enough to warrant using an ice axe they can help with balance. As well as supports when walking poles can be used for checking whether snow over streams or bogs is solid or not. On any but the gentlest hills an ice axe is essential if there is much snow and ice. The length and whether to have a leash are debatable issues. Much more important is to know how to use your axe for both self-belay and self-arrest and to have it in your hand if it might be needed and not strapped on your pack. When an axe is needed only occasionally it can be slid between your back and the pack so you don’t need to remove the latter to get it. Although an ice axe is the primary tool for snow-covered hills it’s not adequate on its own on hard snow or ice. Then you need crampons as well. Walkers don’t need the heavy, complex designs intended for ice climbing. Walkers’ crampons will fit even bendy boots. Few walkers carry a snow shovel but I regard one as an essential winter tool. It can be used for digging snow shelters if you’re stuck out, building snow walls for protection against the wind and digging victims out of an avalanche. The total weight of all this gear, including clothing worn, is around 7-8 kilos, depending on exactly which items I take. That’s not too heavy for enjoyable walking while providing all the protection and safety needed in the winter hills. 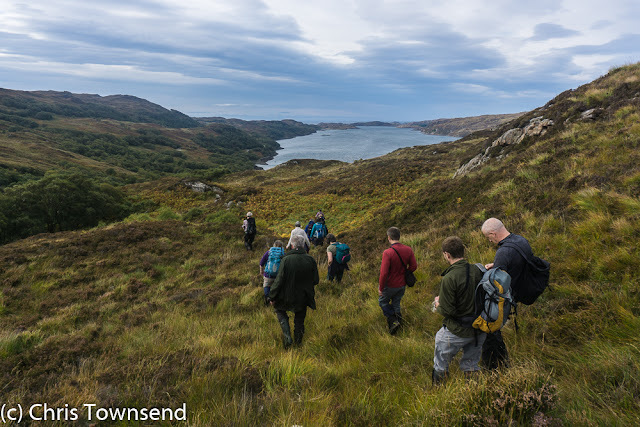 Every September the trustees and staff of the John Muir Trust have a meeting close to one of the Trust’s estates so we can meet local staff and local people and see what’s happening on Trust land. There's also more time to talk to other trustees and staff members than at most meetings. This year the meeting was at Inchnadamph in Assynt next to the Quinag estate. The weekend forecast was for mixed weather. There was some beautiful sunshine on Saturday morning – timed to coincide with our formal indoor meeting. Trying to ignore the sunshine and the wonderful view (I deliberately sat with my back to it to avoid distraction) we discussed many topics and made some potentially significant decisions. 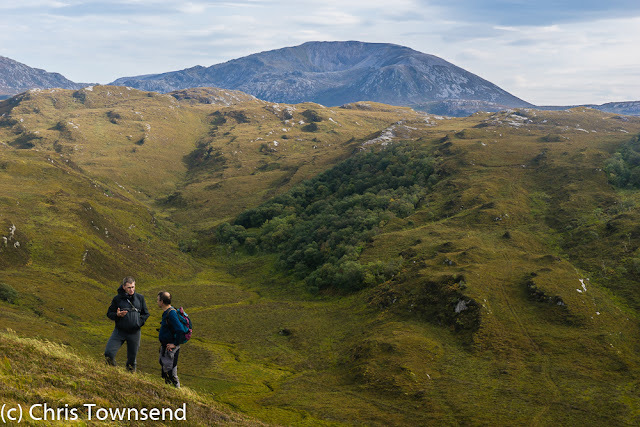 The meeting was positive but I think we were all relieved to get out into the now fading sunshine for a windy walk on the northern part of the Quinag estate above Loch Cairnbawn with Property Manager Don O’Driscoll. Here we looked at the slowly regenerating forest with too many of the tiny birches pushing through the heather heavily browsed by deer. From a small knoll we stared down to the loch where the white arrows of gannets flashed over the wind-driven waves and two kayakers struggled to make headway against the gale. To the south the huge prow of Sail Gharbh, one of Quinag’s three summits rose above a denser part of the Ardvar woodlands and I thought back to my splendid walk and camp on the mountain two years earlier. The following day dawned windy and cloudy. Determined to climb a hill while here I decided on Cul Mor as it doesn’t require a long walk-in and it didn’t look like a day I’d want to spend too many hours out. After an early lunch or perhaps more correctly second breakfast of a tasty cheese toastie and mug of coffee in The Elphin Tearooms I headed up the hill. The wind had dropped now, making for a sweaty ascent as the air was humid and warm. 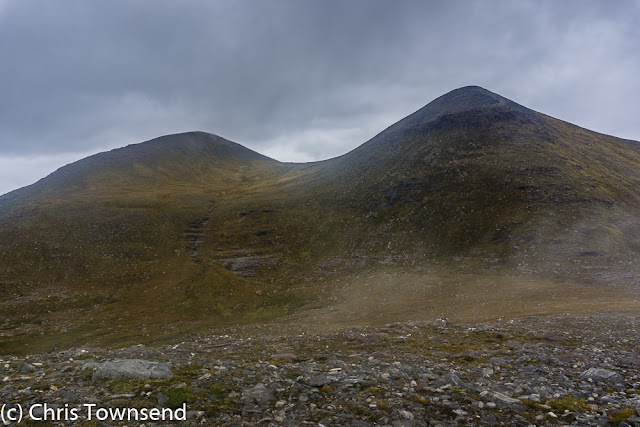 Soon I was in wet cloud, a familiar place this month, having experienced the same conditions in Coire na Ciste and on Braeriach, Beinn a’Chaorainn and Beinn Teallach. I don’t need this much navigation practice! In the hidden corries below the rocky slopes of the hill stags were bellowing and grunting. The land was brown and yellow and faded red. Autumn was here. From the descent I had one sight of the summit before the clouds closed in again. There was no real rain but the air was so wet I was drenched by the time I was back at the car. A drive to Ullapool, a quick change into dry clothing, and I was at The Ceilidh Place for a reviving meal. Then came the drive home and with it the rain, torrential rain with much surface water and spray. An unpleasant drive but as always I wondered why I didn’t visit the North-West more often. I’ll be back soon I promised myself. 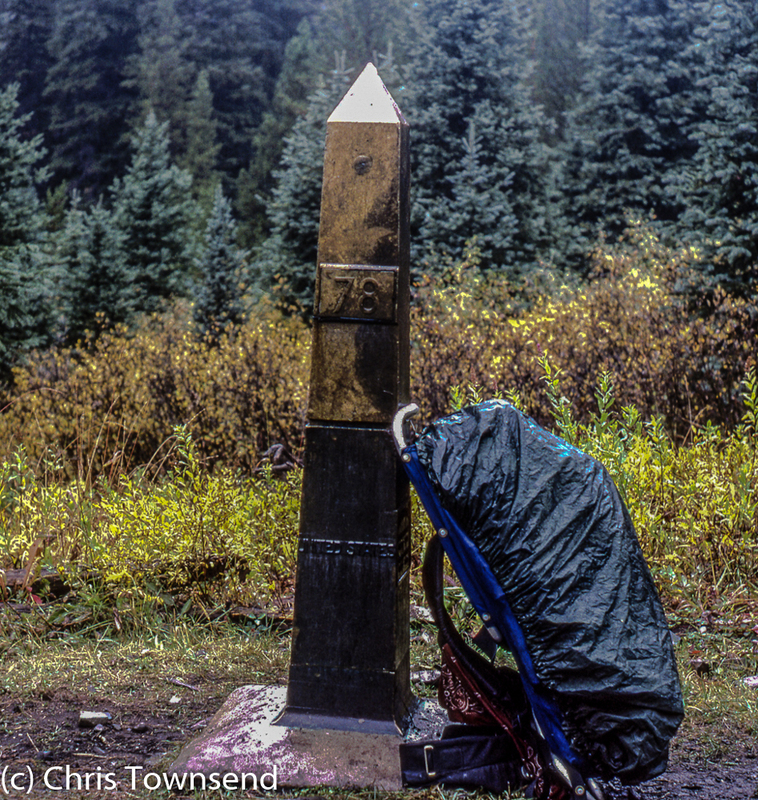 In recent days I've seen many pictures of people finishing the Pacific Crest Trail at Monument 78, which marks the border with Canada, and which has been enlarged since I was there as the PCT has grown in popularity. There'll be more pictures to come as this year's hikers complete the trail before the snows of next winter set in. I can share the feelings of those finishing even though it's 35 years since I reached the Monument. It was pouring with rain back then and no-one else was there. I don't have a picture of myself, just this one of my pack. No-one was to know I'd finished for several days. And few people saw any of my pictures for quite a while either in those pre-Internet, pre-digital days. But the satisfaction of completing a big adventure was just the same as it is today. My journal is full of notes about what was to happen next. Where I'd stay, getting to Vancouver and so on. The only comment about finishing says 'fact that it's over hasn't registered yet and probably won't until I reach Vancouver or even London'. I also noted that it was 'an excellent way to spend six months'. It would be many years before I realised just how significant the walk had been. 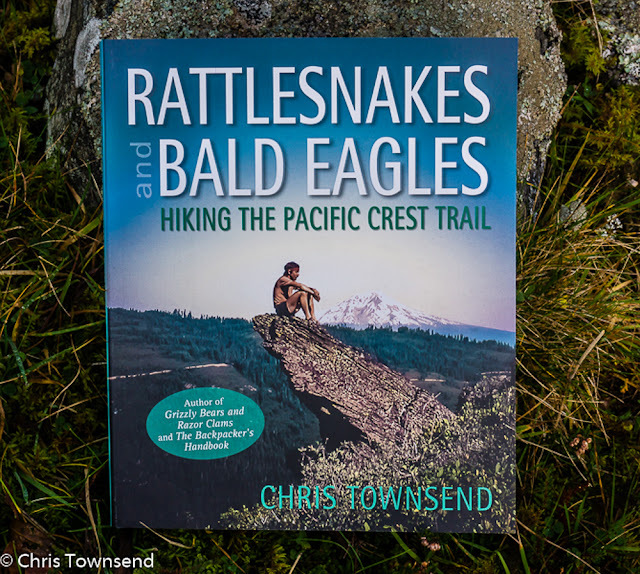 The slow winding down of the walk had been going on for many days though, my mind jumping to life beyond the trail for the first time since I'd left Mexico almost six months earlier. The seasons were changing too. The mountains shone with autumn colours and a few times in the last weeks snow fell, a reminder that winter was coming and soon the trail would be buried deep. Finishing in the autumn after starting in the spring and walking through the summer felt appropriate. Nature was winding down too. 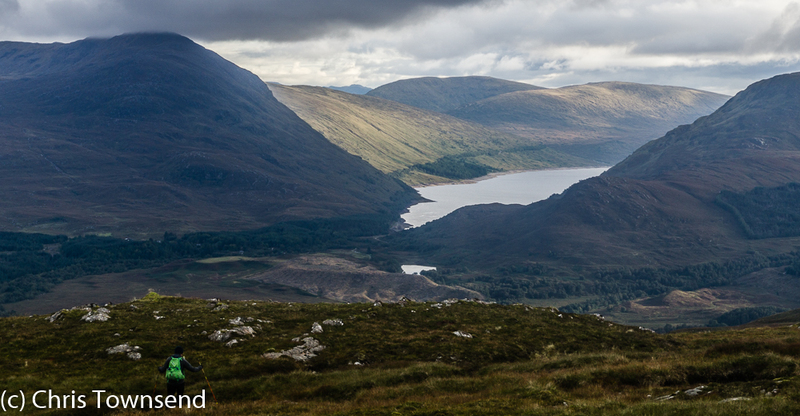 Beinn a’Chaorainn and Beinn Teallach are not the most renowned Munros though both have their attractions, like all hills. 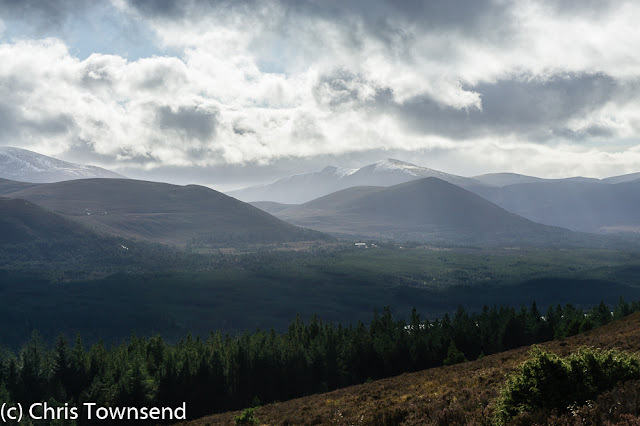 In other areas they would be better known but with Creag Meagaidh on one side and the Grey Corries not far away they are often neglected for these grander hills, as can be seen by the rather sketchy and intermittent paths over the summits. No well-trodden walkers’ highways here. I admit to often passing by these hills myself and I hadn’t climbed them for many years until last weekend. It wasn’t my idea either. 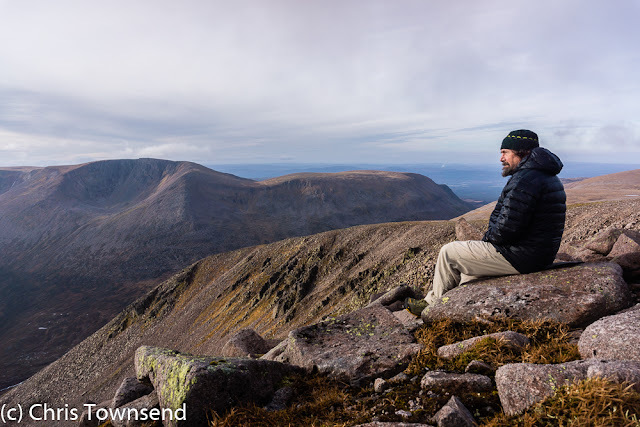 Fellow outdoor writer David Lintern suggested them, initially because he was interested in looking at the East Ridge of Beinn a’Chaorainn, a summer scramble and winter climb. 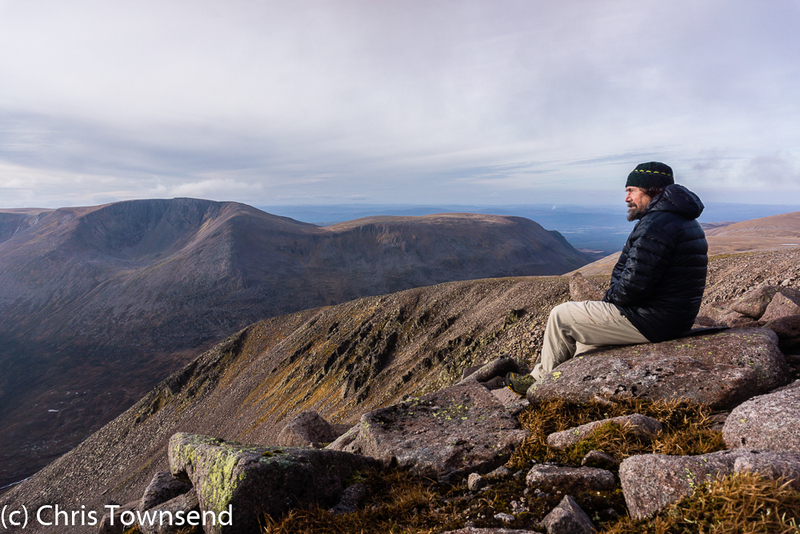 The weather forecast looked better west of the Cairngorms so I was happy to agree. I wanted a night out though, which David couldn’t manage, and so didn’t fancy an unknown scramble with a big pack. We’d stick to the walking routes we decided. The promised fine weather – 90% likelihood of cloud-free skies – hadn’t materialised when we set off through soggy woods under a soft grey sky. The tops were in cloud and soon we were too as we approached the southernmost of Beinn a’Chaorainn’s three summits. The ascent up featureless heather, bog and grass slopes was enlivened by conversation about conservation, photography, gear and more. Although David had recently moved to Strathspey we hadn’t seen each other in quite a while. Occasional views back under the clouds to shining Loch Treig gave excuses to pause and catch breath. 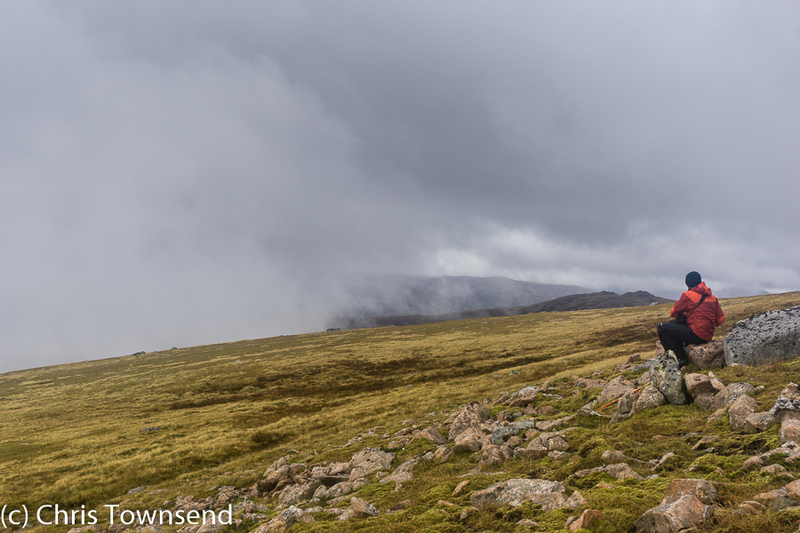 A brief stop at the first cairn and we set off for the central and highest summit. Or at least we thought we did. 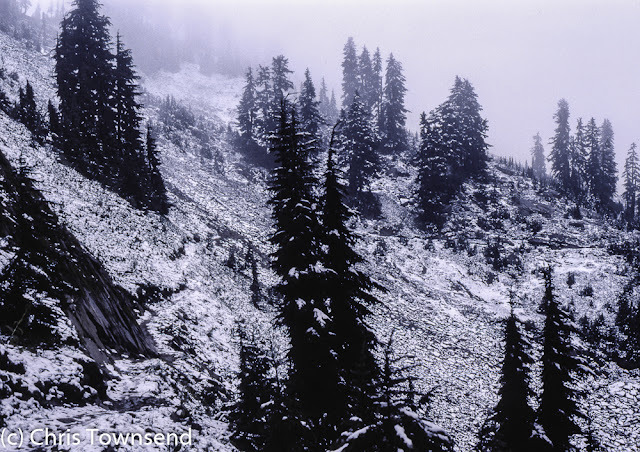 Despite the minimal visibility we were certain we knew which way we’d come up and therefore the direction in which we should go. The compass said otherwise but the direction it indicated was surely the way we’d come. Check with the GPS as we walked. Yes, the compass was right. We were heading completely the wrong way. Turning we followed the compass. It still felt wrong but we knew now it wasn’t. How easily we’d been turned through 180 degrees in the dense mist. Pay attention! Between the three tops big cliff-rimmed corries bite into the long summit ridge so care was needed not to stray on these slopes. In winter when cornices build up a few people have gone through them and fallen into the depths below. All we saw were occasionally glimpses of rocky slopes dropping into nothingness as the clouds swirled and rose and fell in a cold northerly wind. Rain began. So much for clear skies. We came out of the cloud on the descent to the col with Beinn Teallach then climbed back into again. Teallach is a smaller, lower hill though and the visibility quickly improved as we began to descend. David departed and I cast around for a camp site. 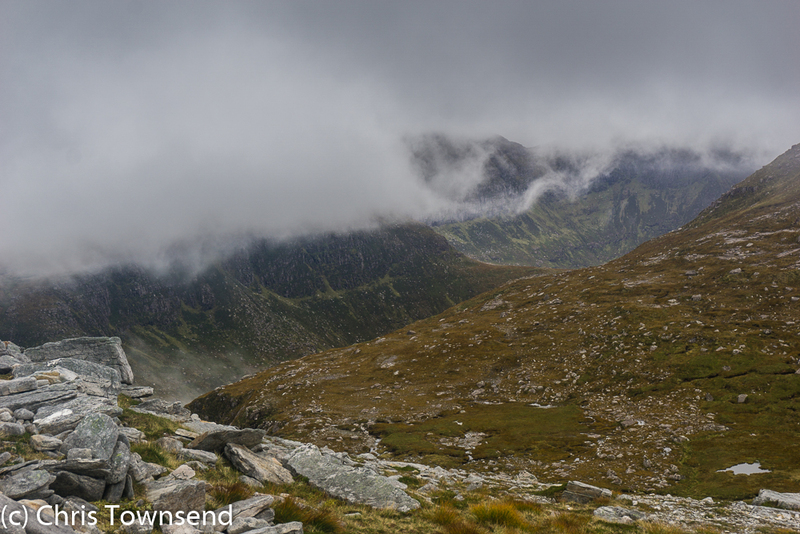 Not too high as I wanted to stay out of the cloud and the strongest wind. Everywhere was sodden. 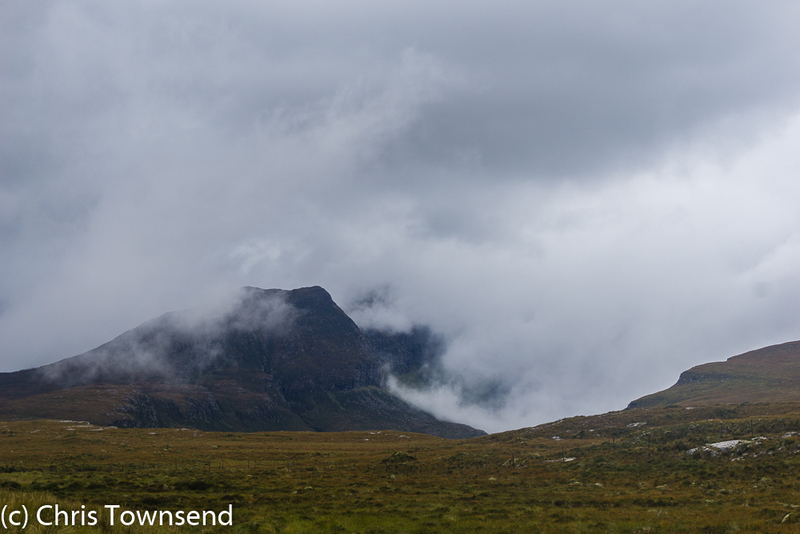 My map showed peat hags on the southern slopes of Teallach and it was indeed very boggy. Every flattish area oozed water. I continued down. 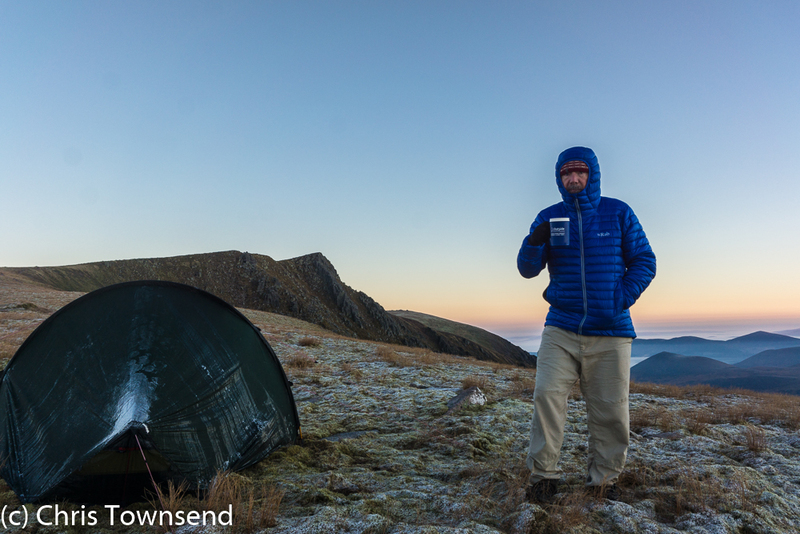 If I wasn’t to have the brilliant night skies and colourful sunset and dawn from a high camp Id been hoping for I might at least find somewhere comfortable. 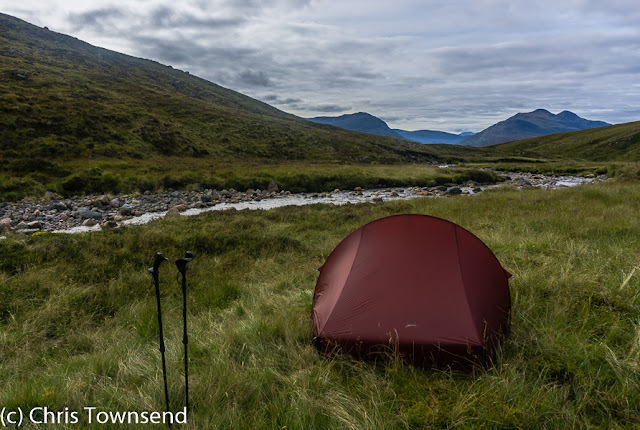 I ended up in the glen between the two Munros, pitched on dryish ground by the Allt a’Chaoruinn with good views south to the Loch Treig hills. 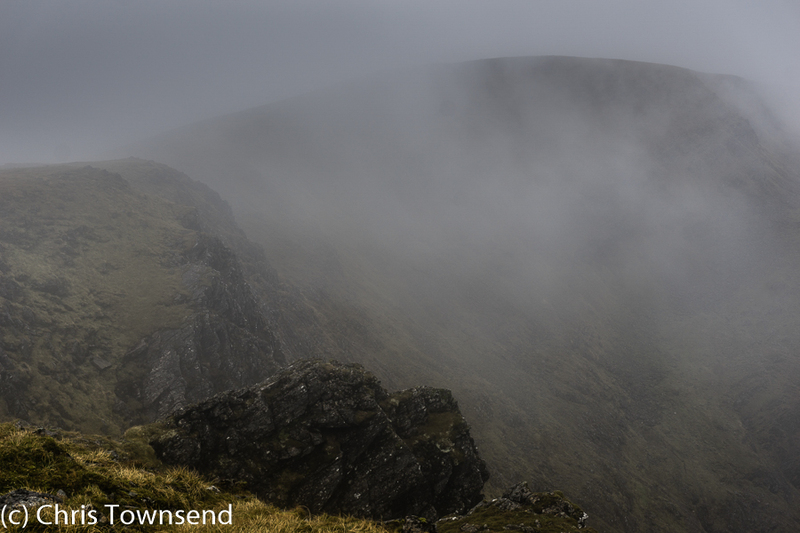 The skies never cleared and the next day I just had a couple of hours walk back down the glen.